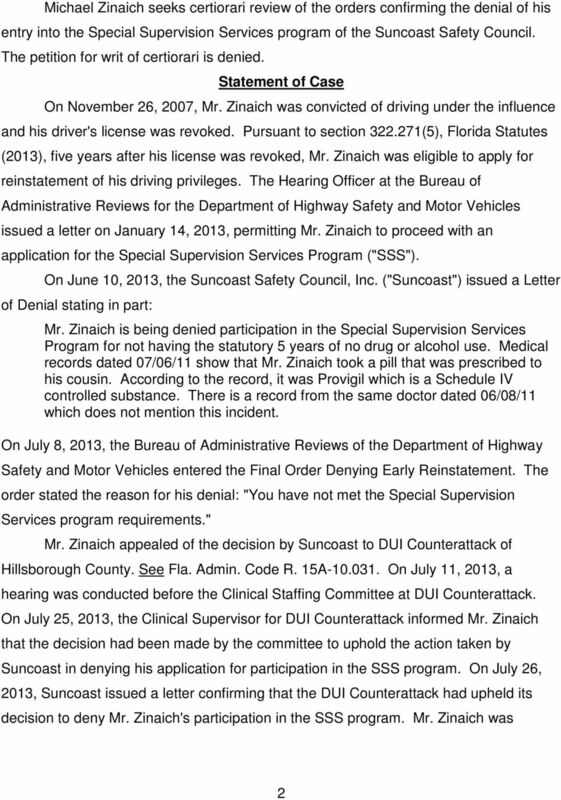 Download "NOT FINAL UNTIL TIME EXPIRES FOR REHEARING AND, IF FILED, DETERMINED"
1 Petition for Writ of Certiorari to Review Quasi-Judicial Action, Department of Highway Safety and Motor Vehicles: DRIVER S LICENSES Early Reinstatement Suncoast Safety Council observed the essential requirements of law when it denied Petitioner's request for restricted reinstatement of revoked driving privileges pursuant to Section (5), Fla. Stat. (2013); Fla. Admin. Code Rule 15A Statute requires no drug or alcohol consumption for five years prior to application for reinstatement. 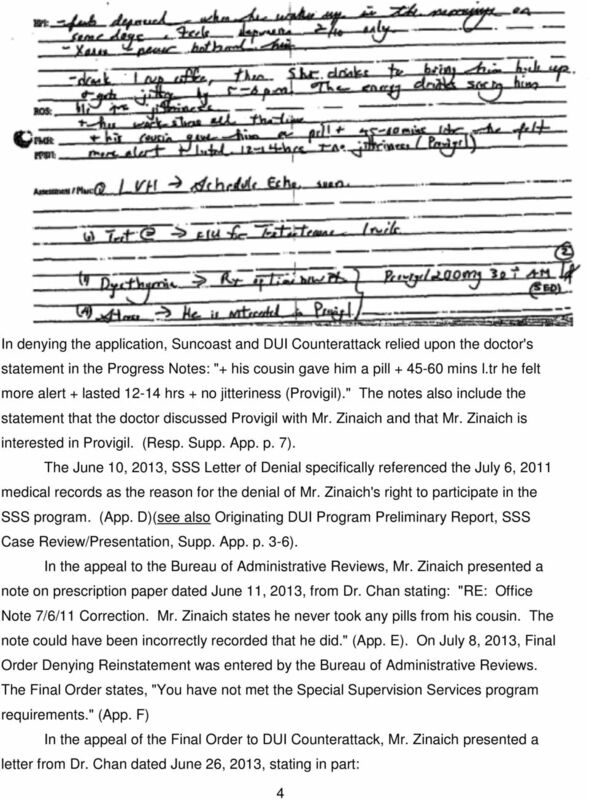 Medical records from Petitioner's doctor indicated that Petitioner consumed medication that was not prescribed for Petitioner during the five-year period prior to application. Petition denied. 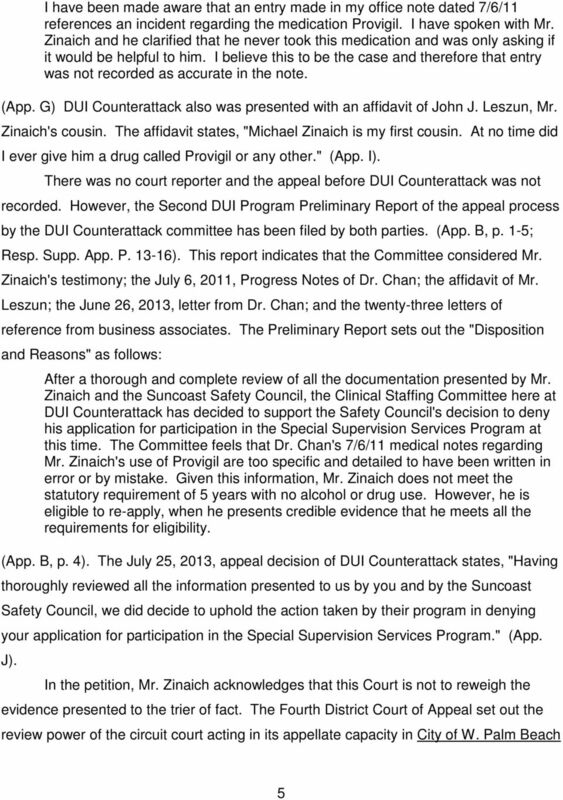 Zinaich v. Fla. Dept. of Highway Safety and Motor Vehicles, No AP-88A (Fla. 6th Cir. App. Ct. May 9, 2014). 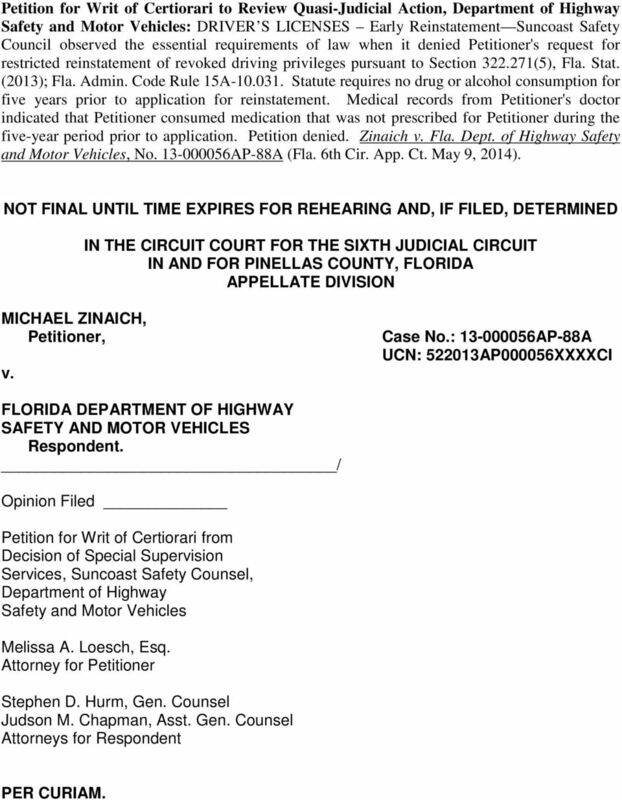 NOT FINAL UNTIL TIME EXPIRES FOR REHEARING AND, IF FILED, DETERMINED IN THE CIRCUIT COURT FOR THE SIXTH JUDICIAL CIRCUIT IN AND FOR PINELLAS COUNTY, FLORIDA APPELLATE DIVISION MICHAEL ZINAICH, Petitioner, v. Case No. : AP-88A UCN: AP000056XXXXCI FLORIDA DEPARTMENT OF HIGHWAY SAFETY AND MOTOR VEHICLES Respondent. 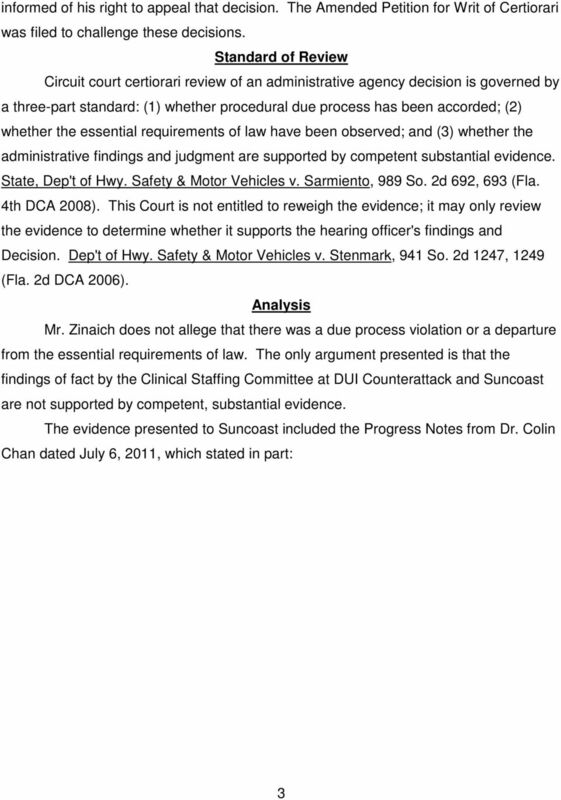 / Opinion Filed Petition for Writ of Certiorari from Decision of Special Supervision Services, Suncoast Safety Counsel, Department of Highway Safety and Motor Vehicles Melissa A. Loesch, Esq. Attorney for Petitioner Stephen D. Hurm, Gen. Counsel Judson M. Chapman, Asst. Gen. Counsel Attorneys for Respondent PER CURIAM. CASE NO. 1D10-1766. An appeal from an order of the Business and Professional Regulation. County Civil Court: INSURANCE Personal Injury Protection A sedan-type police vehicle, used primarily for business purposes, is considered a private passenger motor vehicle under Florida s PIP statute. CASE NO. 1D13-5603. Therese A. Savona, Chief Appellate Counsel, Florida Department of Health, Tallahassee, for Respondent. S T A T E O F T E N N E S S E E OFFICE OF THE ATTORNEY GENERAL 425 FIFTH AVENUE NORTH NASHVILLE, TENNESSEE 37243. April 9, 2002. Opinion No. CASE NO. 1D11-4761. An appeal from an order of the Judge of Compensation Claims. Paul T. Terlizzese, Judge. CASE NO. 1D13-5821. Adrian R. Bridges of Michles & Booth, P.A., Pensacola, for Respondent. IN THE DISTRICT COURT OF APPEAL FIRST DISTRICT, STATE OF FLORIDA FLORIDA HIGHWAY PATROL, v. Petitioner, NOT FINAL UNTIL TIME EXPIRES TO FILE MOTION FOR REHEARING AND DISPOSITION THEREOF IF FILED CASE NO. SUPREME COURT OF FLORIDA CASE NO. SC02-152 KEVIN M. STEELE, Petitioner, vs. SUSAN B. KINSEY and UNITED AUTOMOBILE INSURANCE COMPANY, Respondents. ORLANDO COMMUNICATIONS LLC, UNITED STATES DISTRICT COURT MIDDLE DISTRICT OF FLORIDA ORLANDO DIVISION Plaintiff, v. Case No: 6:14-cv-1022-Orl-22KRS SPRINT SPECTRUM, L.P. and SPRINT CORPORATION, Defendants.